Each member of my family—my wife, three children and I—are heavy iPod Nano users. We never got into the iPods with hard drives because they were just too large. When the first Nano model came out I immediately went out and got one for each of us. We do a lot of travel as a family and figured the iPod would be a great way to help reduce the quantity and volume of "Are we there yet?". At that point we were all still Windows users, each of us running some flavor of Windows XP and using iTunes on it. The Nanos were perfect for us and regardless of where we fell on the technical proficiency scale they were mastered very quickly. We imported our CD collections and began buying our music through iTunes. Over the years we cycled through at least one iPod each. For my wife, son and I it was because we upgraded to a newer model with more memory, video capabilities, etc. My daughters were a different story. Either both of them are fond of carrying bricks in their oversized purses or they have a secret pet rock fetish but both have managed to crush the display on their Nanos. My oldest daughter is very pragmatic about it and was quite happy to just take the ones that my wife or son had upgraded from. My youngest however is a gadget fiend and simply has to have the latest and greatest device. "Daddy, I would love to get an iPod Touch. Have you seen the screens on them? They are SOOOO cool! Can I please have one?" Ugh. I don’t know where she gets this obsession with technology. Needless to say she did get an iPod Touch for Christmas last year and happily showed it off to everyone. 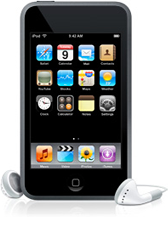 While I was quite happy with my last generation iPod Nano (no video) because of the tiny size and 8GB capacity, there was a part of me that coveted that iPod Touch. When we bought the MacBook Pro a little over a week ago we were able to take advantage of the promotional program Apple is running for people that qualify for an educational discount. There are benefits that my wife gets from teaching at a public high school and this is one that I enjoy the most. Not only were we able to get a discount on the MacBook Pro itself and Applecare, we were also able to get a free iPod with up to a $299 rebate. Since the 8GB iPod Touch was $299 I figured this would be a great time to get one. The Touch is an interesting device and a marvel of engineering. The large display on it is simply stunning. After the display the biggest difference between it and the standard iPod line is that there are only two external buttons: The Sleep/Wake—On/Off button at the top edge and the Home button on the face. This is a bit of a challenge because I normally operate my Nano by feel. My thumb feels the click wheel on the Nano and I can pause, change the volume or skip to the next or previous song without ever looking, even when I’m out jogging. The Touch requires my full attention when operating it however. The position of the controls is handled directly on the touch display, a display that can reorient itself based on the attitude of the device. Hold it straight up (Portrait) and you get slightly different control surfaces than if the Touch is on it’s side (Landscape). For this reason alone the Nano will continue to be my primary music device, at least for exercising. The Touch has many capabilities though, some changing the way I access my primary computers. Perhaps the coolest feature of the iPod Touch is the ability to surf the web using Wifi and the internal Safari browser. If you have not seen an iPhone or iPod Touch browsing the web you will be stunned that something so small could actually be so functional. Though it does require a Wifi host to tap into I can generally find them in most of the places I frequent. I’m a big Gmail fan and the mail program in the Touch can hook right up to it and provide a highly readable interface to my e-mail. Though I wouldn’t want to compose anything of length on the Touch’s display based keyboard, it is pretty easy to type on. If you have large fingers it would likely be a bit of a challenge though. I’ve found that now when I am upstairs watching TV with my wife I’ll keep the Touch handy because it’s so quick and easy to check e-mail or pull up a web site that is referenced on the program we’re watching. It isn’t something I would spend an extended amount of time on but is perfect for that quick reference. About the only thing negative I could think of with the iPod Touch is that its polished surface—both the display glass and the chrome back—show every finger print and smudge. Within a day of getting the Touch I went over to my local Best Buy and purchased a DLO Jam Jacket for $21. It provides a rubberized case that ads a little to the bulk of the Touch but in return makes it feel highly ruggedized. The small clip on the back of the Jam Jacket doubles as a headphone holder so you don’t have to wrap the headphones around the business end of the display. This makes it even easier to just grab it quickly and check e-mail or the web. When we bought the MacBook Pro and the iPod Touch we had to pay for the Touch up front. The $299 was supposed to come as a rebate. I’ve always hated rebates. The companies that provide them often squirrel out of them by telling you that you didn’t include the correct UPC code or you wait for 6-8 weeks and just forget about the darn thing. Apple is different. When we bought it they gave me a little card and the Apple Store employee told me to go online when I got home and fill out the form. He even offered the use of the Macs on display if I wanted to do it immediately. I ended up going home and filling out the form, a very brief one that basically had me plugging in my receipt ID and confirming my mailing address. It was really simple. Four days later I got an e-mail from Apple indicating that my rebate was on the way. Today I received the rebate check from Apple. Elapsed time to receive the rebate check: 9 calendar days or 5 business days. Apple continues to impress me. Not only are they producing cutting edge products that I thoroughly enjoy using, they are running their business exceptionally well.